This colors as in the rainbow are defined as pure hue (ie without any admixture of other colors). Technical definition (in the CIECAM02 model): the degree to which a stimulus can be described as similar to or different from stimuli that are described as the unique hues (red, green, blue, and yellow). Different hues can be obtained by mixing two primaries, two adjacent colors or two complementary colours in equal or unequal proportions. A color wheel is an abstract illustrative organization of color hues around a circle. Each angle corresponds to a hue. The variation that you see regularly in color intensity between the center and the edge of the circle is due to a saturation variation (not to a hue one). 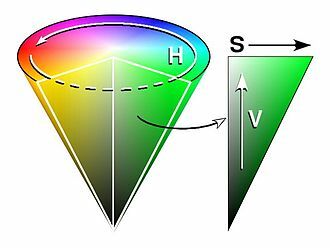 See also the hue saturation value cone. A unique hue is defined as a color which an observer perceives as a pure, without any admixture of the other colors. The degree of purity of a hue is defined by the color intensity property.